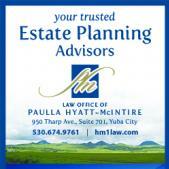 The Law Office of Paulla Hyatt-McIntire focuses on estate planning and trust administration and probate. The firm represents individuals in estate planning matters includes preparation of revocable and irrevocable trusts, business succession planning and formation of family limited partnerships. The practice also represents Trustees and beneficiaries in trust administration and probate matters, and includes elder law and estate gifting issues as well as establishing special needs trusts to protect public benefits eligibility.